Fujitsu's Lifebooks have always been favored by business people and ambitioned private users because of their reliability. With the Lifebook S710, the Japanese have now launched a 14 inch notebook onto the market that shouldn't lack power despite its small size. Read in our review if this symbiosis of a compact case and strong processor can work smoothly. However, there's no need to worry. Naturally, only the case of Fujitsu's Lifebooks is black and white, while the screens are able to display colored images. 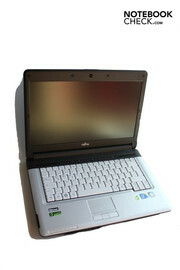 Since the breakaway from Siemens, the Japanese have been primarily producing laptops for business use. The Lifebook S-Series has also been conceived for the business man, or of course, the business woman, who are looking for an efficient and at the same time small and light system without the high-end power of a workstation. After all, Fujitsu has its Celsius range for this. The Lifebook S710 is quite reasonable in terms of price for a notebook with a few business features. If you only want the best, you can spend 1400 euro and more. You should reckon with 890 euro for the configuration we tested, including a Core i5 520M, a 2 GB RAM and Intel graphics. Basically made in black, both the Fujitsu Lifebook S720's keyboard and the wrist-rest are presented in white. This results in a nice contrast that is quite pleasing for the eye. We find the workmanship unsatisfactory, as it's not exactly on a business level. The front right corner can be bent upwards evidently, the display can be twisted quite intensely, the lid allows pressure from the back to be seen on the screen quickly and the keyboard already bends under the slightest pressure very obviously - if you invest up to 1400 euro in a notebook, you'd expect more. At least the display can be opened single-handedly, as the hinges close tight but don't bid too much resistance. The surfaces also have a very pleasant feel but all this can't conceal the poor workmanship. The Fujitsu Lifebook S710 is quite a mobile device with its 34 centimeters width, 24.5 centimeters depth and maximum of 3.5 centimeters height, as well as its weight of a bit more than 2 kilograms. That what wants to be a genuine business notebook must, of course, include enough connections to really satisfy business people. No wonder that Fujitsu uses all four case sides to build in connections on the Lifebook S710. Under the front edge, from left to right, there is a cardreader that can read SD card, multimedia cards, memory sticks and Memory Pro sticks, a hardware slider for the wireless interfaces, a Firewire port, as well as headphone-out and microphone-in sockets. 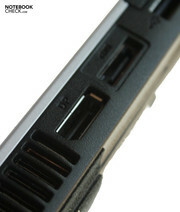 The Japanese start the connectivity on the left with a 54mm ExpressCard slot, under which two USB 2.0 ports are placed. This is followed by an eSATA connection and a display port. These are joined by the fan grid, the VGA port behind a cover and finally the DC-in. A narrow slot is on the upper right, which proves to be a credit card-sized chip reader. With its assistance and a SmartCard, the system can be locked so that it can't be used without the SmartCard. A further USB 2.0 port is found under this and a Kensington lock connection is behind it. A modular bay follows, in which a DVD burner is integrated in the standard configuration. It can, however, be replaced by a second hard disk drive, a supplementary battery or simply an empty slide-in unit for saving weight. 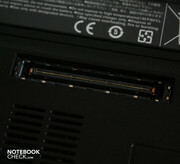 The user will also find a LAN connection and a second option for connecting a notebook lock on the rear. Fujitsu even builds in a connection possibility on the bottom - namely for a docking station. WLAN has been built into our prototype as a wireless interface. This works with all current standards up to 802.11n. Bluetooth is also onboard, whereby data is transmitted in standard 2.1 with EDR. All in all, the configuration is quite lavish and can even be extended by options, like WWAN or a modem connection. The only disagreeable thing is the gap for the modem port, which has simply been closed with a limp rubber skin. Business devices have to bid their customers something special here, as well. The first feature, even before the actual operating system, is hidden in the BIOS. If the computer is stolen, it can be located with the Computrace support as soon as it connects to the internet. This way, the system administrator also knows where the employee's notebook is at all times. Windows 7 Professional 64 bit has been made available as the operating system, but Windows XP Professional is included on a DVD so that it can be installed on the computer if required. There isn't any other unusual software included, though. Apart from the burning tool, Nero Essentials, and a trial version of Norton Internet Security, only smaller system tools are installed, whereby the computer is kept nice and clean in terms of too much unnecessary software. As already mentioned, the Lifebook S710's keyboard bends extremely almost everywhere, and doesn't comply with the quality claim of a business device at all. On the other hand, the typing feel is quite alright. The keys have a short travel and are placed where you'd expect them. They are also sufficiently sized. By the way, Fujitsu doesn't follow the general trend and has made the keyboard in a classic design instead of using a chiclet keyboard. Special functions, like volume control and display brightness, are controlled via key combinations. However, there are a few hot keys above the keyboard. The notebook can, for example, be locked, or energy savings and wireless settings can be called up with these. It might have been more reasonable to give volume control its own key or allow the user to map the keys freely. The touchpad is centered and slightly submerged in the wrist-rest, and has turned out quite small. Its diagonal measures just a bit more than 7 centimeters. In return, the surface has been selected quite well. Fingers don't have too much or not too little resistance. Both buttons below it have a solid and high-end feel. They respond reliably to key pressure. There is even a mouse wheel substitute between them, with which scrolling is made easy. Therefore, a scroll area has been omitted in the touch-sensitive field. The touchpad also doesn't recognize multi-touch gestures. The Lifebook's matt display measures 14 inches and has a resolution of 1366x768 pixels. It additionally has a quite high average illumination of 243.3 cd/m2 - a very good rate. The illumination is also very homogeneous. 89 percent is far beyond the average. Has Fujitsu therefore built a perfect display into the Lifebook S710? - Unfortunately, no. The black value is noticed negatively. It's inappropriately high with 1.58 cd/m2 and therefore turns out very poorly. Thus, black doesn't appear dark and black, but is rather a milky gray. As a result, the contrast, summed up from the black value and maximum brightness, also decreases strongly. The ratio is only a mediocre 154:1 here. The notebook proves to be quite adequate in terms of outdoor use, anyway. The matt display and the great brightness make sure that you can always see something on the screen. The viewing angles are the usual. Everything is basically alright left and right, but much too tight in up and down inclinations. We are overall satisfied with the display, as we've already seen a lot worse in this price category. However, there is still a lot of room upwards with the black value and viewing angles. Due to Intel's fast dual-core processor, Intel Core i5 520M, that clocks with 2.4 to 2.93 GHz, the Lifebook S710's application performance should be very much okay. PCMark Vantage confirms this presumption with a total of 4464 points. The processor also does well in Cinebench R10. However, there is a very big gap between single-core and multi-core rendering. Thus, you should ensure that software supports multiple computing cores, as the performance can then possibly be increased by more than twice. Fujitsu uses Intel's Graphics Media Accelerator HD, which is integrated in the processor, as the graphics solution. This alternative bids a significantly lower performance than a dedicated graphic card and also doesn't have its own graphic memory so that the system memory has to be tapped. Incidentally, it has a capacity of 2048 MB, consists of a DDR3 module and clocks with 1066 MHz. By the way, a maximum of 8 GB RAM can be built in, which can also be used completely due to Windows 7 Professional 64bit's operating system. The gaming performance can't, of course, really convince due to the graphics onboard and the tight RAM. At least 2702 points in 3DMark06 let it seem possible to play the one or other round of an older game after all. The hard disk comes from Fujitsu, has capacity for a not very opulent 160 GB of data and rotates with up to 5400 revolutions per minute. The hard disk benchmark didn't reveal any exceptional results. The access rate of 18 milliseconds is just as common as the average transfer rate of 59.8 MB per second. We check if the system is capable of communicating with connected peripherals in real time with the DPC Latency Checker tool. If single Windows processes are kept too long in the waiting loop, for example, due to erroneous drivers, interruptions can evolve in their communication. This would be especially annoying in the professional field. However, the Lifebook S710 shows its best side here. All latencies stay under 1000 microseconds and therefore within a green field. You don't have to worry about the Lifebook S710's soundscape, despite the strong processor. The device always stays pleasantly quiet, especially in idle mode. We measure 30.2 dB(A) when the device isn't loaded in any way. We reach 30.5 dB(A) with a slight load increase - a minimal increase that is almost still within the measuring tolerance limit. The hard disk also barely emits more noise with 31.1 dB(A). Even noise sensitive persons won't be annoyed by Fujitsu's S710 in an idle state. We can determine a medium noise of 33.7 dB(A) under load and a maximum operating noise of 37.3 dB(A). Thus, the device remains fairly endurable even in its loudest fan level. If you want to watch a DVD, you'll have to live with a noise level of 36.1 dB(A) as soon as the drive accesses movie data. That's not very quiet but most users shouldn't feel very disturbed while enjoying their movie. Despite the unobtrusive fan and the strong CPU, the temperatures also stay within a limit. Strangely enough, we can determine the highest temperature in an idle state with up to 35.9 degrees Celsius on the bottom's left. It's probably because the fan rotates faster under load and the components are, therefore, cooled better. The maximum temperature under load is 34.7 degrees in about the same area. The device never heats up to more than 32.5 degrees Celsius on the upper side, neither under load nor in an idle state. Equally agreeable: The wrist-rest always stays cool and only heats up, if at all, slightly. It's great that Fujitsu has managed to combine processor power with a quiet operating noise and a low temperature and that the case only heats up in places where it's hardly ever touched. The only component that gets a bit warmer is the adapter. However, it also stays within a very acceptable field with a maximum of 45 degrees. The stereo loudspeakers have been placed advantageously above the keyboard. This way no palm and no soft surface can cover them. This advantage is more than ruined by the loudspeaker's sound. The trebles are completely over-emphasized, the midranges are okay, but there isn't any bass at all. If you sometimes listen to classical music, you'll notice that the volume of the small speakers isn't sufficient. The soft tones are barely to be heard and the more sonorous ones aren't powerful enough. Of course, you won't expect a built-in 5.1 sound system with a great bass in a business device. But better speakers could have been built in, in consideration of those who use their Lifebook for something other than only their office. At least there is the possibility of using headphones that can be plugged into the Lifebook's front, which prevents cables getting into the way of the mouse hand. The sound over the built-in socket is perfect and also has an adequate volume so that you can really enjoy movies and music. Those who buy a 14 inch notebook will expect a fairly enduring battery life, as the quite light and compact case with the matt display is just inviting for taking along on the go. The Lifebook S710 isn't a complete failure here, but only manages to give an average presentation. At least with the 56 watt hour, 6 cell battery built into our prototype. A bigger battery with a 62 watt hour capacity is also available, though. A supplementary battery can be built into the extension slot, which supplies a further 41 watt hours of energy. The battery charges quite fast in our standard configuration (whereas 46 watts are drawn out of the mains even in an idle state) but, as already mentioned, the battery life is only average. The battery lasts for a maximum of 253 minutes, that's 4 hours and 13 minutes, which sounds rather reasonable. The runtime, which is far below that with 2 hour and 13 minutes under load, really shocked us. The strong processor likely takes its toll here. We can establish a good 2½ hours for movies, and almost 3 hours for WLAN surfing in our practical test, which also proves that the processor can be very energy saving if it wants to. 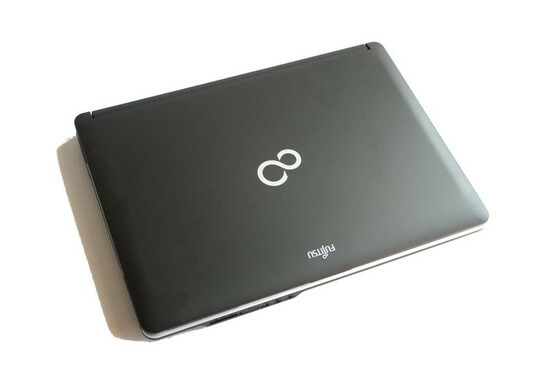 Because Fujitsu tries to develop its devices as energy saving as possible, at least according to its own marketing, the Lifebook S710 also wears the ProGreen Selection label. That is supposed to guarantee that the energy supply has an efficiency of at least 80 percent. Aside from that, the device has two stars on the GreenIT label and has been rewarded with the American EPEAT seal. We can only determine just how environmental-friendly the device does its job based on the marketing promises from Fujitsu and the power consumption. This is a very good minimum of 12.9 watts, if the device isn't put under load. A maximum of 57.1 watts is drawn from of the mains; we achieve a consumption of about 20 watt during WLAN surfing. As it's already been signaled in battery life, the differences between low load and full load are quite big in view of power consumption. But if you don't permanently play games or execute other complex computations, you can rather orientate yourself on the lower consumption margin. The Fujitsu Lifebook S710 bids some business features for little money. However, the workmanship suffers for that. The case can be evidently twisted in some places and typing on the keyboard feels like writing on jelly. Apart from the somewhat too small touchpad and the fairly short battery life under full load, the device doesn't permit itself any other major flaws. The display is very good for most needs, the connectivity is more than just complete, and its distribution also leaves almost nothing to be desired. And then there is the almost always very quiet operating noise, the low heat emission and the business features, such as a button for locking the notebook and the possibility to secure the system with a chip card reader. The docking port and extension slots are also details that are rarely found in this price range. It's also great that the Lifebook S710 can combine good application performance with quite low consumption rates. 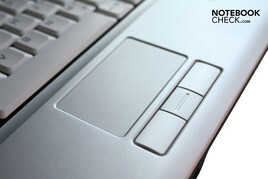 Besides that, the notebook has numerous options to reduce its power consumption even more. If you are willing to connect an external keyboard or accept the wobbly feel and are looking for a fairly mobile device with some equipment, but want to save money, you should make place on your desk to trial run the S710. 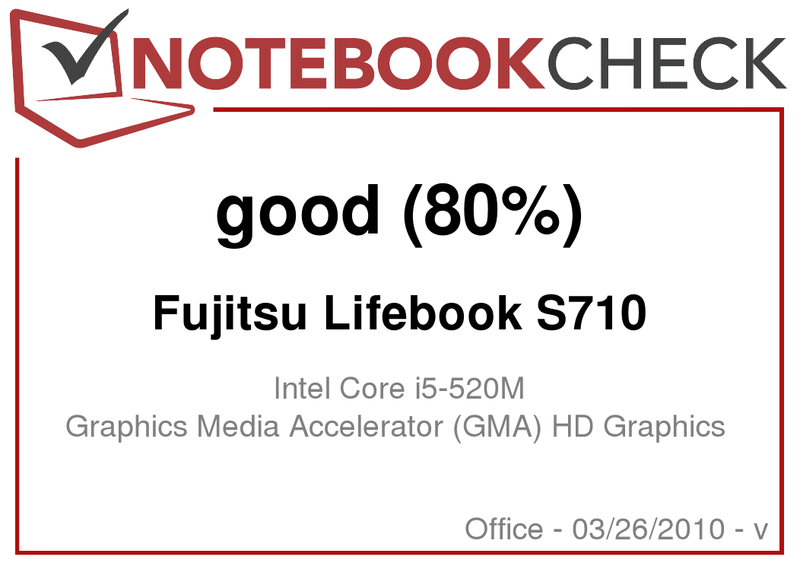 In Review: Fujitsu Lifebook S710. Fujitsu introduces a business notebook that is easy on the wallet with the Lifebook S710. By the way, the loudspeakers can't convince us, as their sound is too thin. Volume and brightness control are only possible with key combinations, though. 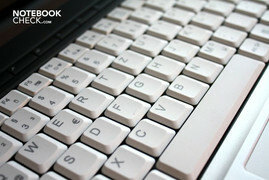 There are numerous hot keys above it, with which the notebook can, for example, be locked. Unfortunately, the keyboard has a loose fit and bends considerably. Fujitsu builds, for example, a modular extension slot in as a business feature, which can be equipped with a DVD drive, hard disk or supplementary battery. The limp rubber covers, under which unused ports are closed, don't appeal to us so much. However, the hinges are quite stable. Unfortunately, the Lifebook's workmanship isn't very good. The familiar black and white design has been selected for this. Fujitsu also wants to score with its looks. There is also a VGA port, however it's hidden behind a cover. ...just like a docking interface and an eSATA. Nevertheless, there aren't to be any major losses in terms of connectivity and performance. ...and the webcam over the display. The numerous business features, and in particular the modular slot - really practical! In any case, a more stable case, best would be with a solid keyboard. How cool and quiet the device stays, despite the strong processor. The mySN MB6.a also wants a place as a business starter, but has significantly fewer connections. If you don't need quite as much application power, you could take a look at the business leader, Lenovo, and its new ThinkPad Edge, but you'll have to accept the glare display. The Asus K50IJ will come home for less money but also with less equipment.